A Tender Heart » Blog Archive » Will we ever be safe??? Will we ever be safe??? Wow! I was so scared by that toilet paper, I wet my pants. Ironic, huh?! I like the black and white…makes it even more foreboding! Our toilet paper looks like that when Elora tries to wipe for herself…she doesn’t have the tearing-off part down yet. Let the seemingly endless fascination begin. Kids are so funny about TP. Hilarious! And such an adorable “monster”! 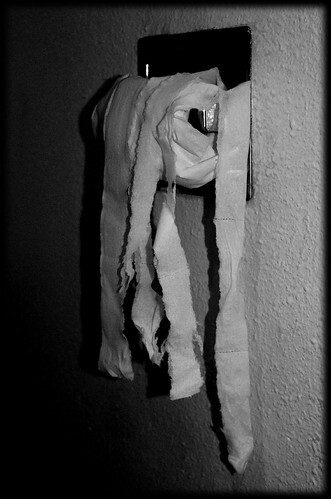 :) Love the effects on the tp pic – reminds me of a mummy’s wrappings! ;) Be prepared, though – that is one of MAAANNNNYYYYY rolls of toilet paper you will lose to your darling little monster (and other monsters to follow, I’m sure!) And beware the other monster favorite – Kleenex…no box is safe!! I’m afraid that over the years, hundreds of tissues have perished at the hands of our little monsters – nearly always under gleeful shouts of “It’s SNO-WINNNGGG!! !” :) Now when you come over to my house you won’t have to ask why the Kleenex is on top of the fridge! 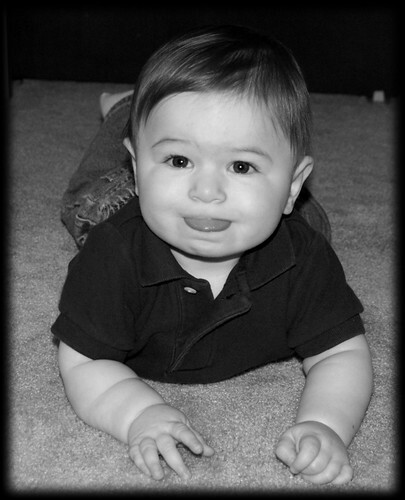 COL (Chuckle Out Loud) – The little monster.